The Siphon (or Vacuum) Coffee Maker brews by using two chambers where vapor pressure and vacuum produce the finished coffee. The use of this brewing method can be traced back to the 1830’s where one of the first patents filed for a vacuum device was held by a German gentleman named Loeff from Berlin. Many more patents with “improvements” quickly followed, one being that of Madame Vassieux of Lyons, France in 1841 which looks markedly similar to the one which I’m currently using. The Siphon works by heating and cooling the water gases (vapor) from the lower vessel (carafe chamber) to the upper vessel (infusion chamber) and back again as brewed coffee to the carafe chamber. During brewing, a small amount of water and vapors will remain in the carafe chamber so that the atmospheric pressure will uphold the column of water in the siphon. Once the proper brewing time has been reached (about 2 minutes for a 5 cup model), the heat is removed from the carafe chamber which relieves the pressure in the carafe chamber and allows the brewed coffee to “vacuum” back down from the infusion chamber. 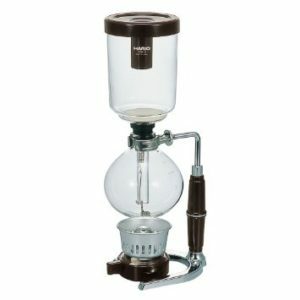 For a more detailed explanation of how a Siphon Coffee Maker works, check out this article on CoffeeGeek.com. Drop the cloth filter into the top infusion chamber with the chain hanging down into the siphon tube. Pull the chain down and hook it to the bottom of the siphon tube. Fill the lower carafe chamber to the 5 mark with hot water (closer to boiling shortens wait time). Fill 5 tablespoons of coffee (more or less to preference) into the infusion chamber (using a slightly finer grind than drip). Ignite your heat source and place directly beneath the lower carafe chamber. It should take about 4 minutes or so to boil. Once the water reaches boiling, it is siphoned through the glass tube, past the filter and into the top infusion chamber. Agitate the coffee with a back and forth motion to fully saturate the grounds. After about 2 minutes, agitate the coffee once again, then extinguish the heat source. Once the carafe chamber starts to cool, the coffee is siphoned back down into it. Gently rock the top infusion chamber back and forth until it can easily be removed (placing it in its convertible lid/stand) and serve the coffee directly from the lower carafe chamber as a decanter. Now sit back, relax and enjoy your siphon coffee.